For other uses, see Hegra (disambiguation). 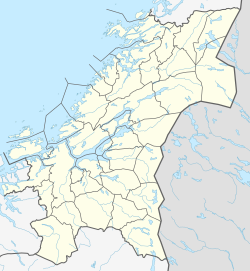 Hegra is a village in the municipality of Stjørdal in Trøndelag county, Norway. The village is located in the Stjørdalen valley, about 10 kilometres (6.2 mi) east of the town of Stjørdalshalsen along the Stjørdalselva river and it is therefore a good site for fishing. The 0.41-square-kilometre (100-acre) village has a population (2018) of 524 and a population density of 1,278 inhabitants per square kilometre (3,310/sq mi). The village is served by the unmanned Hegra Station on the Meråker Line. The European route E14 highway also runs through the village, just south of Hegra Church. Hegra has its own grocery store, gas station, kindergarten, school and a local bank. Hegra is also one of the centers for the resurgence of the Dole Gudbrandsdal horse in Norway. The village was the administrative centre of the old municipality of Hegra which existed from 1874 until 1962. The ancient rock carvings (Leirfald), as well as the small border fort Hegra Fortress (formerly known as Ingstadkleven Fort) are both located in Hegra. The fortress withstood the invading German army from 10 April to 5 May 1940, not surrendering before all other Norwegian units in Southern Norway and Mid-Norway had capitulated. ^ "Hegra, Stjørdal (Trøndelag)". yr.no. Retrieved 2018-03-26. This page was last edited on 8 March 2019, at 03:52 (UTC).